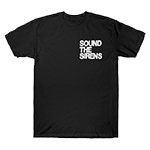 Sound the Sirens Magazine is an independent online magazine, run by fans and writers who love music, film, television and culture. We publish with absolutely minimal advertising and are one of the few online magazines that do not hit you with content obtrusive pop-ups and sponsored content. We ask your help to keep the lights on by donating to help pay for basic running costs and to assist in paying what keeps this website going- our writers. While Sound the Sirens Magazine is a small independent company, we aim to be part of the growing movement supporting freelance writers and creatives who deserve to get paid for their hard work. We are working to be a viable destination for freelance writers and are moving away from the “work for us for the exposure and experience” way of thinking. And we need your help. There are three ways you can help Sound the Sirens Magazine. We are forever grateful.